Knee joint is between lower end thigh (femur) bone, upper end of Shin bone (Tibia) and Knee cap (patella). Fracture can invole either lower end of femur, Upper end of tibia or Patella. 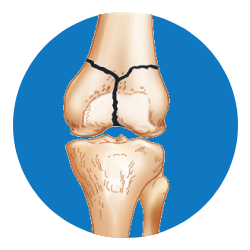 Fractures around knee joint are more often associated with ligament injuries (ACL, PCL, MCL, LCL) & Meniscal (Medial or Lateral) Tears. Displaced fractures are treated surgically. Distal Femur Fractures: treated with Nailing or Plates & Screws, Bone grafting when necessary. Proximal Tibia Fractures: treated with Plates & Screws, Bone grafting when necessary. Patella: Tension band wiring, Screws.